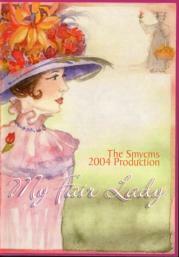 Our 2004 production was another box office biggie, My Fair Lady, a Lerner and Loewe masterpiece that was based on George Bernard Shaw’s play Pygmalian. The original Broadway cast starred Rex Harrison as Henry Higgins, Julie Andrews as Eliza Doolittle and Stanley Holloway as her father Alfred Doolittle. It first opened in New York on 15th March 1956 and ran for 2717 performances and is brim full with well known songs, such as ‘ Wouldn’t it be loverly ‘, ‘ On the street where you live ‘, ‘ I could have danced all night ‘ and ‘ With a little bit of luck ‘. Proffessor Henry Higgins an expert in phonetics decides to take on a wager from his friend Colonel Pickering that he can’t take a cockney flower girl and turn her into a lady that the upper classes will accept as their own. Confident in his own ability, Higgins soon makes acquaintance with Eliza Doolittle and installs her in his home and begins the slow process of coaching her to speak proper english. Meanwhile coalman Alfred Doolittle, Eliza’s father, learns of the situation and tries to capitalise on the events unfolding. He is unsuccessful. More successful is Proffessor Higgins who sees his project start to impress, first at a race meeting at Ascot where she manages to charm everyone including a young man called Freddie Eynsford-Hill, who becomes smitten. Then later at a magnicent ball she is studied most intently by Zoltan Karpathy, one of Higgins ex-students, who announces to all that Eliza is clearly from European nobility. Once again Eliza carries off the deception but receives no praise or recognition from Higgins so she leaves and goes to stay with his mother. In the meantime Alfred Doolittle becomes something of a philosopher and made some money into the bargain, and is lured into marriage by his long term sweetheart. Higgins can’t understand Eliza’s actions and goes to see her at his mother’s home but he is told, in no uncertain terms that he is a rude, selfish egomaniac. He leaves and is soon back in his study musing on the differences between a man and a woman. The door opens and Eliza is back, Irascible as ever, Higgins demands his slippers as the curtain closes. With assiduous work the arrogant Higgins succeeds in turning Eliza into an elegant debutante, but then finds that he can’t live without her. FAIR ATTEMPT AT MUSICAL NEEDS SOME FINE-TUNING. My Fair Lady, Church Hill Theatre, **. Thom Dibdin, Edinburgh Evening News, Wednesday 31st March 2004. ” the stage bursts into a bustling hive of high kicks and superbly crafted choreography, as the whole chorus help Eliza’s dustbin man dad, Alfred, in Get Me To The Church On Time.” and ” It is a bold, bright and bustling My Fair Lady, which local amateur company The Smycms have created for the Church Hill this week ” . This was another of Smycms productions that proved hugely popular with our audience, despite receiving a luke warm review, it did go on to have a very entertaining week, with the majority of opinions expressed being favourable. This was the show where Tony McDonald, being a tad overweight, could have done with some oxygen each night after the particularly energetic Get Me To The Church On Time . June however was a bit more astute in her observations as she shouted across the Rehearsal hall, “Tony you’re too FAT ” Ah bless her!! Artistic Director – Laura Jordan Reed, Musical Director – Jerry Gregson, Choreographer – June Geissler.